This site is dedicated to Photography and presents samples from my own portfolio as well as on-line exhibitions. 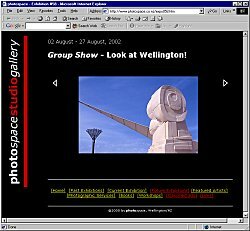 There are links to photo-related sites, institutions, organisations and other photographers with special emphasis on New Zealand. My LINKS and INTERNATIONAL GALLERY LINKS pages are frequently updated and extended with new photography links. I am now working on the third installment of the 11 Years project, revisiting Wellington locations in eleven-year intervals. 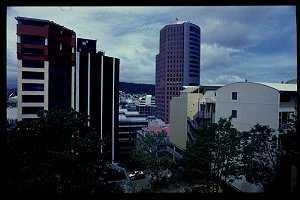 photospace Gallery, Wellington, in August 2000. 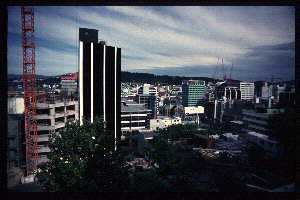 Annually the Worldwide Pinhole Photography Day is held on the last Sunday in April. Check the official web site www.pinholeday.org for details. We often are having a pinhole workshop with children and parents on the day. Visit the News Archive for previous news items. I'm maintaining other web sites on the New Zealand contribution to The Tile Project - Destination: the World, Running in New Zealand and my home town Cologne. The latter features the local dialect Kölsch. This site was last updated on 29 April 2006.